Gutters are the hidden helpers of your home, directing water and other debris from your roof and keeping things tidy around the home. Few things are more integral to the well-being of your landscape than a professionally installed gutter and downspouts drainage system from Four Seasons Roofing. Without a proper gutter system, rain water would simply drop from the edge of the roof onto the ground below, and seep into the foundation of your home, causing major water damage. We properly direct roof "run off" away from the foundation walls of your home, which is your first line of defense against crawl space or basement flooding, a serious concern that could cause you thousands of dollars if you’re not prepared. A good drainage system will also protect your existing siding from water "backsplash" that causes paint damage and wood rot, while also preserving the topsoil closest to your home, keeping your basement nice and dry, and your grass healthy and beautiful. A proactive approach always beats losing money with unexpected events. Installing a gutter is a bit of a tricky project, and it best completed by an experienced home specialist like our team at Four Seasons Roofing. 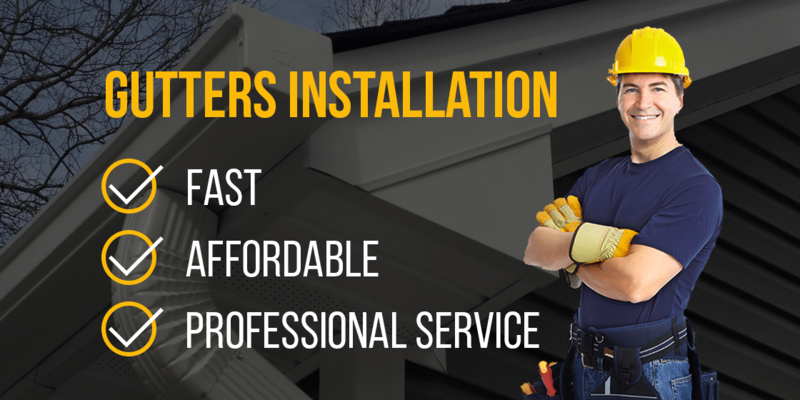 We’ve installed and repaired hundreds of gutter systems throughout Maryland and take pride in the quality and satisfaction we bring to customer after customer. We begin with an in-home consultation where we assess your current drainage system and detect any repairs or replacements that may be needed in your gutter and downspout. If you don’t currently have a gutter system in place, we make a plan based on the personal nuances and needs of your property. We can also guide you in detecting damage, flood concerns or signs of fascia board that will require replacement. Any homeowner who’s thinking about repairing or replacing their system, or is simply unsure and curious about the current state of their gutter and downspout should call our team at Four Seasons Roofing as soon as possible. A friendly team member will meet you and provide all the information you need to know to take the next step in your project. Give us a call or fill out the quote form on this page, and we’ll schedule a no-obligation visit right away.